A handmade, decorative paper produced from the pulp of banana stalks (family Musaceae). Banana paper has a warm sandy color, fibrous texture and a delicate woody aroma. It has no fillers and is acid-free. A thin, translucent tissue paper made also from banana pulp is called banana skin. 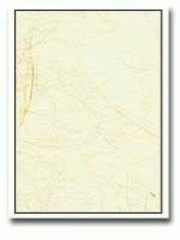 Banana paper is used for drawing, collage, printmaking, stationery, and decoration. Encyclopedia Britannica, http://www.britannica.com Comment: "Banana." Encyclopædia Britannica. 2004. Encyclopædia Britannica Premium Service. 25 Apr. 2004 . This page was last edited on 29 April 2016, at 13:59.